Covington’s Cael Vanderhorst works to control the arm of Versailles’ Caleb Kaiser in a 120-pound match. Versailles’ Nick Monnier works a chicken wing against Covington’s Austin Flick. Versailles’ Jacob Poling looks to score a takedown on Covington’s Connor Sindear Tuesday. 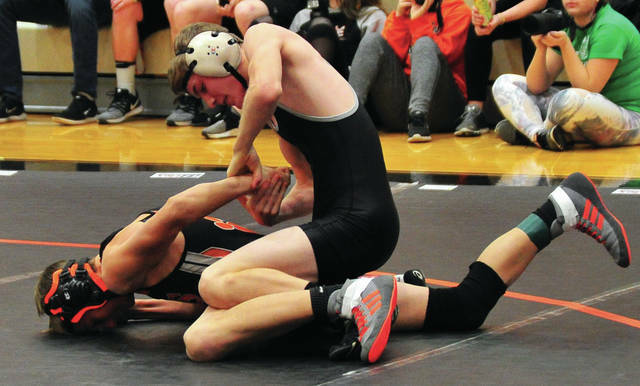 VERSAILLES — It has always been a good early season matchup to see how D-III wrestling powers Versailles and Covington match up. And Tuesday night in the Versailles High School gym was no exception. It came down to the final two matches, with the Tigers recording two pins to erase a 29-24 deficit and come away with a 36-29 victory. And Covington coach Eric Vanderhorst had no complaints. Grilliot (220) recorded a pin at 3:41 to give Versailles a 30-29 lead and Nerderman got a first period pin in 1:05 to finish off the match. Michael Reed (106) got Versailles off to a fast start with a pin in 26 seconds. But, Covington returning state placers Kellan Anderson (113) and Cael Vanderhorst (120) turned the momentum the Buccs way. Anderson recorded and 11-0 major decision and Vanderhorst won by pin in 1:37 to give Covington a 10-6 lead. 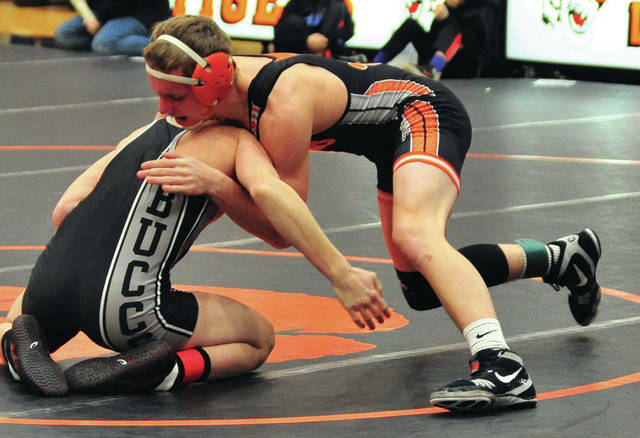 Jacob Poling (126) answered with a pin in 3:54, Trevor Huber (132) recorded a 4-0 decision and Carson Bey (138) won by forfeit to give Versailles a 21-10 lead. Covington then reeled off three straight wins of its own. Austin Flick (145) eda pin in 3:55 before the highlight match of the night. 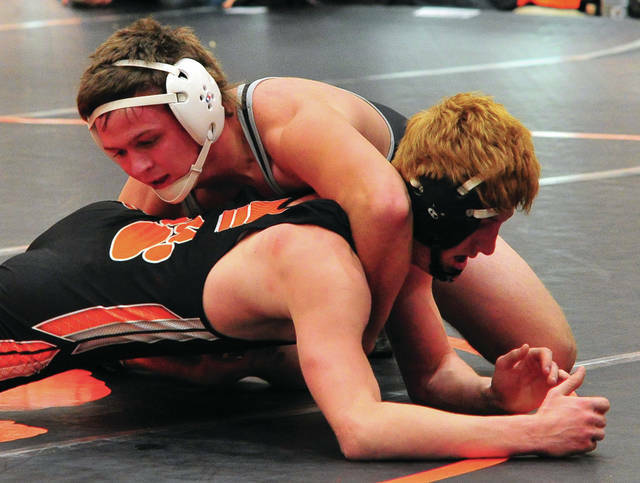 Keringten Martin (152) wrestled for Covington and Cael Bey (152) moved up to that weight for Versailles. In the end, Martin used a reversal in the second period to come away with a 4-1 victory. A.J. Bey was hoping for a little different result. Dylan Burns (160) won a 9-7 decision with a late takedown to give Covington a 22-21 lead. The two teams exchanged decisions with Tyler Gigandet (170) winning 3-0 for Versailles and Gavin McReynolds (182) winning 3-1 for Covington. Gage Kerrigan (195) just missed a tech fall for Covington, recording a 21-8 major decision, giving the Buccs a 29-24 lead before Versailles closed the match with two pins to take the victory. Like it always is when Versailles and Covington get together on the mat.